This sword is well balanced and the tight handle wrap feels great. Comes complete with a black cotton storage bag. Surpassed all my expectations at this price. Well constructed and it looks like it was lovingly made with exquisite detail - as beautiful as it is deadly! 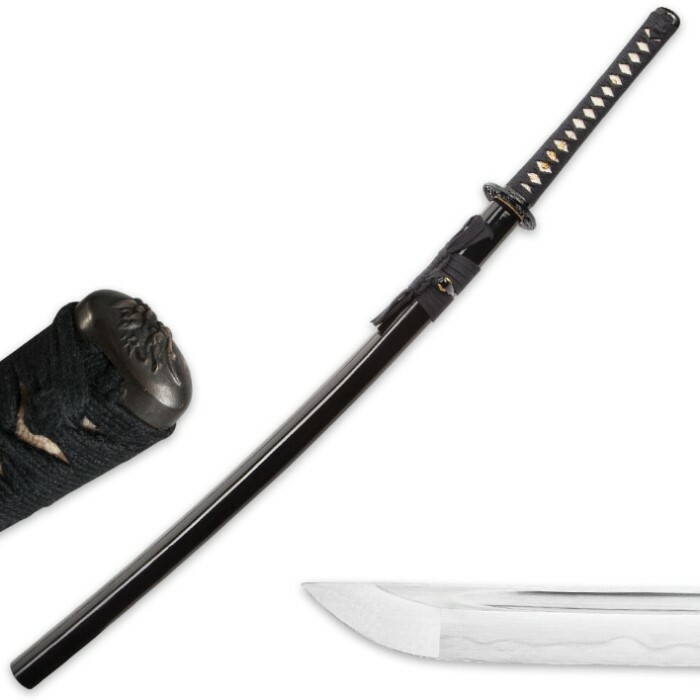 After researching handmade/forged swords for hours and many different sites, I was amazed to come across this Musashi clay tempered Katana for such a reasonable price. I bought it for my husband as a gift. We are both "Forged in Fire" addicts. This sword arrived in perfect condition. The blade is straight and extremely sharp. Everything about this Katana screams quality. Don't let the price suggest something different. It's a beautiful work of art, well balanced with a full tang. 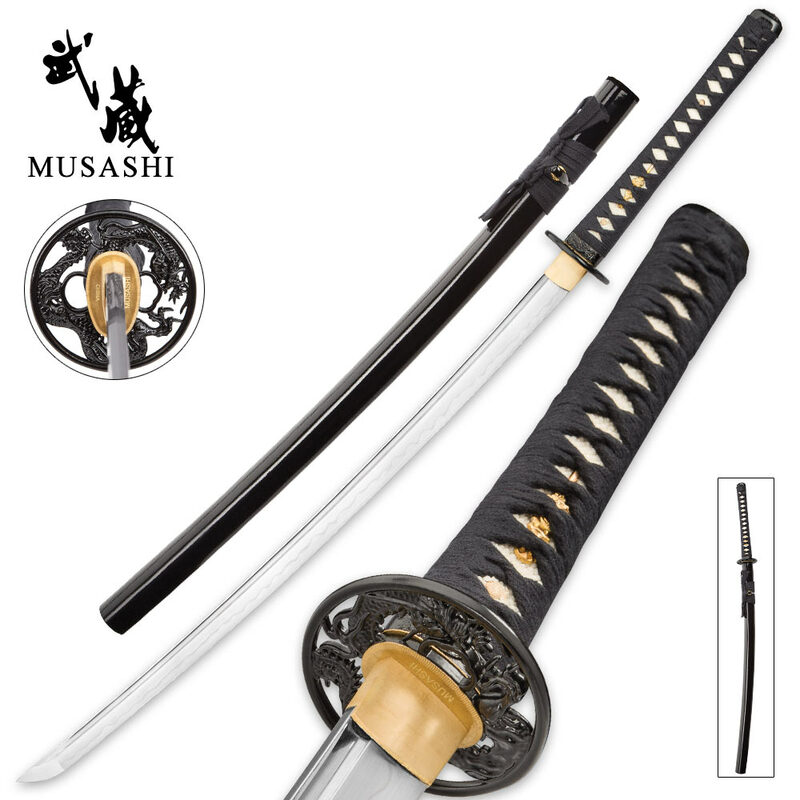 Musashi is one of the best value katana makers on the market. This fine piece delivers in all the important areas and at a very comfy price. Well made! beautiful, strong, sharp, and solid. just got it. took it for a walk, in flint mi. and cant say a single bad thing. best money I've spent in a long time. I purchased one of these recently, and I have to say that of all my swords (I also have 7 European style swords), this one is the best regarding both quality of craftsmanship and materials. Some of my other swords cost twice as much, and are made of 440 stainless and the grip constantly loosens on the tang. Nice for hanging on a wall, but could never be used for "home defense" unless you wanted to beat someone with a metal stick :o) The hamon on this one is just subtle enough and is clearly "organic" and irregular, as it should be. Definitely not wire brushed or fake. Everything is tight and well assembled. The sword slides easily but then seats snugly into the scabbard. The packaging was very good as well. The blade was oiled and wrapped in cellophane. The cardboard box and cloth cover were also good quality. The sword arrived in perfect condition (no scratches, fingerprints, etc). The only thing that looks or feels a little cheap on it is the cord wrapping on the scabbard (feels like thick shoelace material), but it's such a little detail compared to the rest that it is easy to forgive/ignore. I can't bring myself to cut anything with it for now because it's too beautiful, but it is very sharp indeed. Handling is light and this sword is nimble, exactly NOT like my European swords that feel slow and blade-heavy. 4 weeks later, and I am still amazed at how good this sword is for the price... Definitely recommended. No buyer's remorse. In fact, I'll be buying more Musashi swords! It cuts most boxes fairly well and looks good doing it. I had gotten this sword yesterday and I put it through extreme testing. It is amazing and I am VERY happy with my order. It's not the world best, but for the money, it's SO worth it.